Getting ready for baby there are checklists for everything you need to buy and have prepared. But here’s the big question…how do you know which disposable diaper brand to buy for your baby? The diaper selection at your local store has a bunch of different brands, and don’t even get me started on the huge selection Amazon carries! That’s not really a great plan and your odds of success aren’t high. Maybe ask your girlfriends. They all have different answers! Ooh, check the INTERNET. Because that’s totally reliable (and lots of those “best of” lists are sponsored by some brand or another). 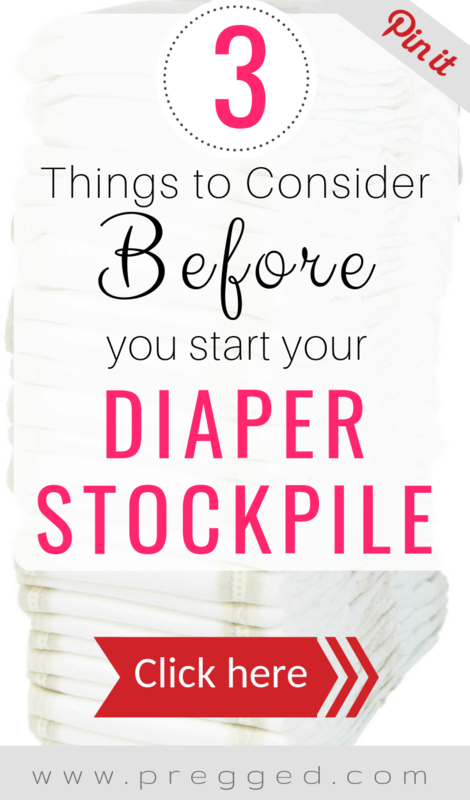 Here are the three steps you need to do prior to starting your diaper stockpile and deciding which diaper brand to buy for your baby. Do you value the eco-friendly aspects of diapers? Do you really want to be able to buy your diapers at a local store? Is price your overriding factor? These are all things that can help you narrow the field when thinking about diapers. From here, you’ll know which diapers to look at; name brand diapers, store brand diapers and/or eco-friendly diapers. There’s so much information available on the internet that it can seem overwhelming. But knowing what’s in your diaper gives you the ability to compare them to narrow down which ones you want to try. Having good quality (read, unbiased) information can help you sort through all the fluffy lingo that gets tossed around. This is a great comparison chart to get an overview of each brand of diapers. There are links to more in-depth information about each brand – all of which will help you decide. Diaper fit is everything. As a diaper expert I just can’t stress this enough. The main problems you could have with your baby’s diapers (leaking or “poo-plosions”) are a result of your baby’s diaper not fitting right. You know all babies are different, but did you know that all diaper brands fit a little different, too? Some are wider/narrower or taller/shorter rise and you won’t know what fits until you physically try it out on your baby. Baby skin is sensitive. And when baby skin gets irritated, we call it diaper rash. There are many reasons for diaper rash, but one is chemical sensitivity. Some babies’ bottoms react poorly to the chemicals in certain diaper brands. There’s no way to know this until that diaper is on. 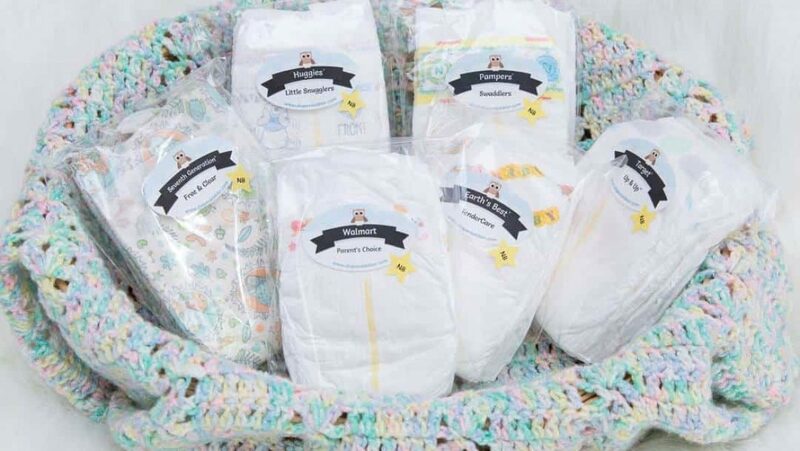 The best way to avoid having boxes of diapers that your baby can’t wear is to get a Diaper Sampler Package. It’s a quick and easy way to try a variety of diaper brands and find the one that suits you and your baby. You can even build your own Custom Sampler Package with just the brands YOU want to try. To stockpile diapers or not? While the idea of stockpiling diapers before baby is born is tempting, it’s also a gamble. Because you won’t REALLY know which diaper will be the best until after baby is already here. But clearly you still want to have SOME diapers at home to feel like you’re prepared. Here’s my best advice…put the diaper stockpile money into savings, buy a few sample packs….and wait. Well-meaning friends and family members will buy you diapers for your baby shower (or a diaper shower), so you’ll likely have some diapers at home before baby comes anyway. After you’ve used the diapers in your sample pack and decided which diaper brand you want to continue using, you can either use the diapers you have or exchange the unopened boxes for the ones you DO want. Plus, remember all those friends who said “let me know if there’s anything you need after the baby comes”? You can tell them to stop at Target on their way to your house and grab a box of your new favorite diaper. This is an awesome guest post by Julie Siewert from DiapperDabbler.com. Head over there and choose your diaper sample packages and follow Diaper Dabbler on Facebook for all your diaper info.